DeMent Askew & Johnson’s client was in his yard filling a birdfeeder with birdseed when he fell and twisted his left leg in an awkward position. He immediately heard a crack and saw that his left ankle was turned in an awkward position. His wife called 911. EMS arrived and transported him to a local hospital emergency room. X-rays revealed a fracture of the tibia and fibula. The attending emergency room surgeon advised that his leg needed to be surgically repaired as soon as possible. The doctor, however, stated that he was too tired to perform the surgery that evening. The doctor told our client that he would perform the surgery at 6 a.m. the next morning. Our client was admitted into the hospital. The next morning, our client was informed that the doctor was unavailable to perform the surgery. The surgery was finally performed at around 6 p.m. later that day, about 25 hours after arriving at the hospital. 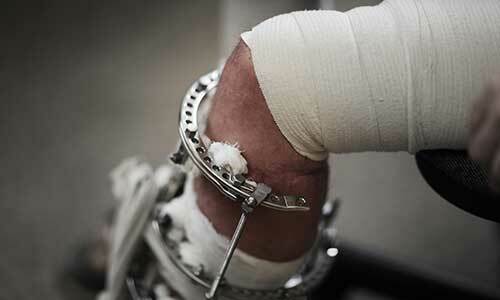 During the surgery, the doctor drove a rod through the shaft of the tibia. He secured the rod with one distal screw only. Nothing was done to the fractured fibula. Our client suffered through severe pain for weeks before a follow-up appointment revealed that the screw had failed and that the rod had collapsed. Our client had to undergo a second much more extensive surgery performed by another surgeon, during which all of the prior hardware was removed and a much more involved system of plates, screws and rods were implanted. Our client had to remain non-weightbearing on the broken leg for over 1 ½ years, and he went through extensive physical therapy. Our client now has one leg that is significantly shorter than the other, and he will always walk with a limp. We had this case reviewed by an orthopaedic surgeon whose opinion was that the first surgeon breached the standard of care by not using the right size rod and by failing to properly secure the rod with the appropriate number of screws. Our expert opined that for this type of injury, the rod should have been secured both at the bottom of the rod, and at the top. Our expert indicated that if these simple steps had been taken during the first surgery, which is standard of care, then the rod repair would not have failed, and our client’s fractured leg would have healed relatively quickly, without complications, and without any significant permanent limitations. Our expert also opined that the delay from the time that our client arrived at the ER to the time of the operation, which was around 25 hours, was also a breach of the standard of care. The surgery should have been done much sooner than that. After securing the opinions from our expert, we successfully settled the case for a confidential amount.